Situated in the Bangkok city centre, overlooking the Chao Phraya river, the Banyan Tree Bangkok is the perfect place from which to explore this exciting city. 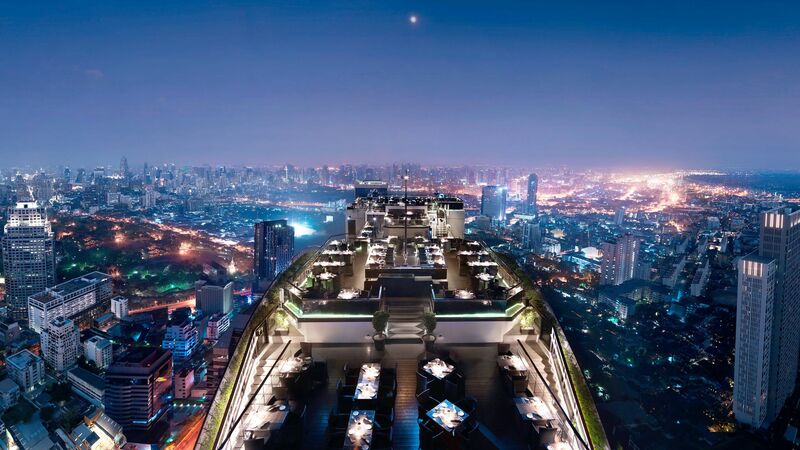 One of the tallest hotels in Bangkok, it offers unparalleled views over its landmarks. Horizon rooms are contemporary in design and offer a generous living area with adjoining bedroom and bathroom. For added comfort, upgrade to a Serenity Club room and gain access to the club lounge serving breakfast buffet, snacks, evening canapés and unlimited drinks. 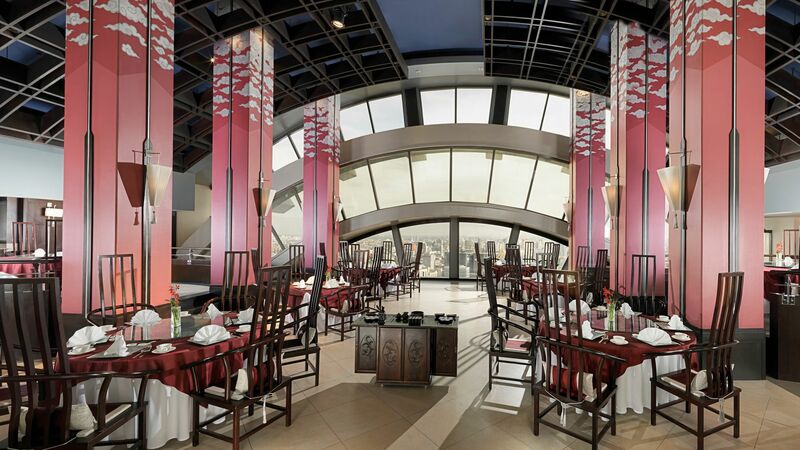 The choice of dining includes among others a floating riverboat, a signature Thai restaurant and an unforgettable al fresco dining experience at the rooftop Vertigo restaurant. No stay at the Banyan Tree Bangkok would be complete without a visit to their award-winning spa, a real oasis of calm in the middle of this bustling city. Casual. Flip-flops and athletic apparel are not permitted. Enjoy traditional Thai cuisine on board an elegant riverboat, sailing down the Chao Phraya river. 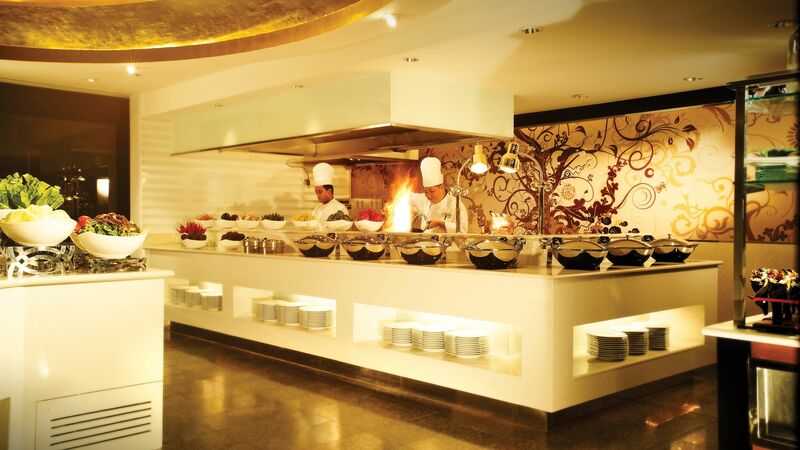 An all day international buffet restaurant serving a selection of hot & cold meats, seafood, salad spreads and hot stations with mouthwatering dishes. Sample traditional Cantonese cuisine with a contemporary twist complemented by an extensive tea list chosen by an in-house tea sommelier. Smart Casual. Slippers, flip-flops, athletic apparel and backpacks are not permitted. Gentlemen are kindly requested to wear long trousers, closed shoes and sleeved tops. 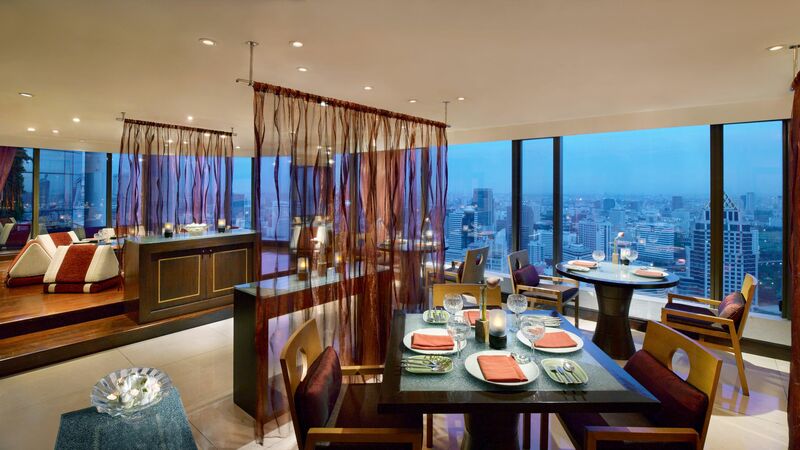 Sample signature dishes in this contemporary Thai restaurant. 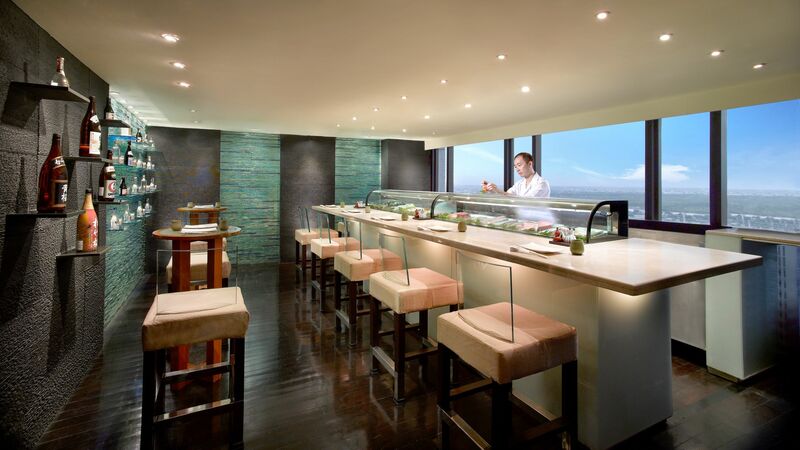 Sample mouthwatering teppanyaki and an extensive sake selection at this contemporary Japanese restaurant. A fantastic rooftop venue offering al fresco dining with magnificent city views. 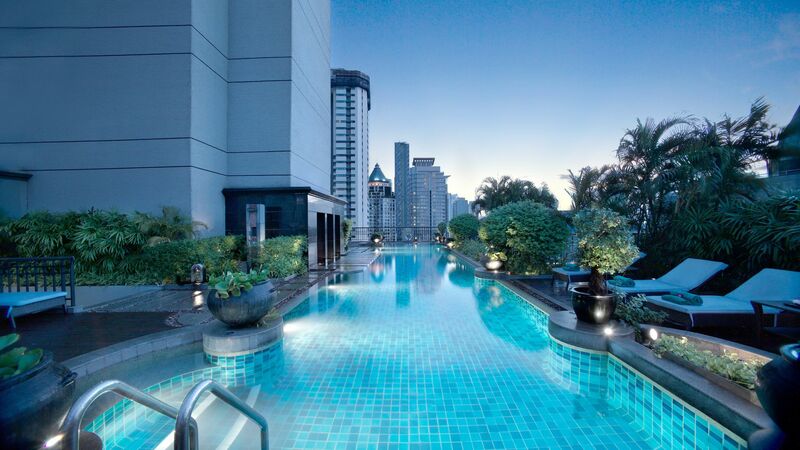 Situated on the 21st floor, this outdoor pool features ornate plants and delicate lighting. This holistic spa offers a place of quiet calm in the busy city life. Treatments range from classic Thai massages to soothing footbaths. 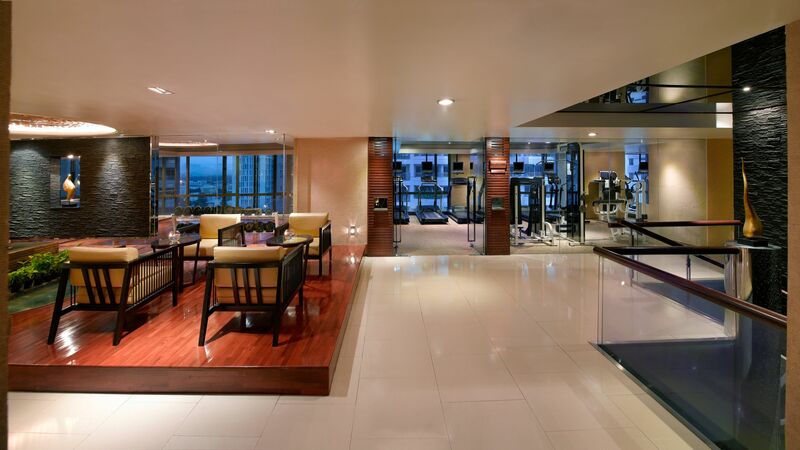 The Health Club offers a range of classes, including yoga, pilates and aerobics, as well as a sauna to unwind in. Bangkok is a whirlwind of a city. Tuk-tuks, taxis and motorbikes whizz past super-malls and grand luxury hotels, locals haggle for their weekly shop in lively markets, and the sound of street food sizzling usually isn’t far away. There are pockets of calm, though – converted rice barges meander up the Chao Phraya River offering slow-paced sightseeing, and traditional spas are tucked away in quiet courtyards and gardens. 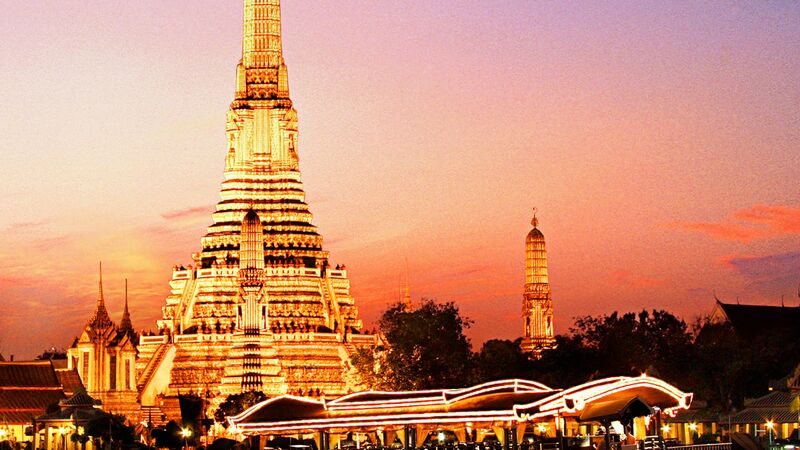 The Grand Palace is a sightseeing must. The former home of Thailand’s royal family is split into three main areas – the outer court, the middle court and the inner court. The outer court is where you’ll find the famous Temple of the Emerald Buddha, which houses a sacred image of the Buddha carved out of a block of jade. Bangkok is just a short flight from Thailand’s islands and beach resorts, so why not finish your stay off with a week or two on one of the beaches of Phuket, Krabi, Khao Lak or Koh Samui? One Bedroom Suites measure 67 - 89m² and feature a king-size bedroom, separate living area, spacious bathroom and a kitchenette. Guests staying in One Bedroom Suites have complimentary access to the Club lounge, featuring full buffet breakfast, complimentary drinks and evening canapés. Horizon Rooms measure 48m² and feature a bedroom with one king or two twin beds, en-suite bathroom and a large adjoining sitting area. Facilities include air conditioning, 2 satellite TVs, safe, minibar, tea & coffee making facilities and fantastic views over the city. Oasis Retreat Rooms are bright with modern design, featuring one king or two twin beds, work and sitting area and bathroom with large bath and rain shower. Serenity Club Rooms are located on the higher floors and feature top class amenities. Guests staying in club rooms can enjoy complimentary access to the Club lounge, featuring full buffet breakfast, complimentary drinks and evening canapés. Save up to 10% on the hotel price when booked at least 15 days prior to departure for holidays between 01 April 22 December 2018 and 03 January - 31 March 2019. Save up to 15% discount on the hotel price when booked 45 days prior to departure for holidays between 01 April - 31 October 2018. Please call out Trusted Adviser for further details. The in-room dining, the check in ,the service, the efficiency, their breakfast is amazing! The lobby is beautiful and their concierge service is top! Their service staff at the porch is amazingly helpful in putting you safely into a taxi that go's by the metre.Love this hotel and makes me keep going back for more! Just stayed for 2 nights in a 1 bedroom suite and it was terrific. Room was large and well laid out, club lounge is large - many families as access is available to those who book suites. The pool area is good - not big but adequate and the spa whilst expensive was worth it. The area is good - lots of local options for food and the 7-11 stores. We ate at Bai Yun which was delicious. We had drinks at Lv 52 - nice spot but the snacks offered from Saffron were overpriced and not very nice. We have stayed at many places in Bangkok and would recommend a stay here. Hotel is Located heart of Silom area.. club level offers a great views and provides access to the club level launge which; offers snacks, afternoon tea and free flow of local beer from 8am-8pm. Hotel has two rooftop bar at the 61st floor. The hotel is located in the embassy district and has a rooftop restaurant/bar with a amazing view. I would recommend to book a room with club access to enjoy breakfast in a quiet atmosphere. The staff is very friendly and helpful. “ Seen it, done it and never again! As always Thai staff were impeccable, polite and prompt. The hotel was clean and in a good location ?? The prices! It was utterly astonishing that these prices were being charged. In every eatery the prices were exaggerated. The information about the trips were incorrect and we were charged differently to what we were advised. Be careful.